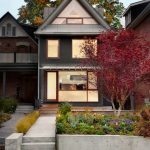 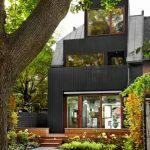 Multidisciplinary design studio +tongtong recently completed a renovation and addition to a traditional Victorian house in Toronto. 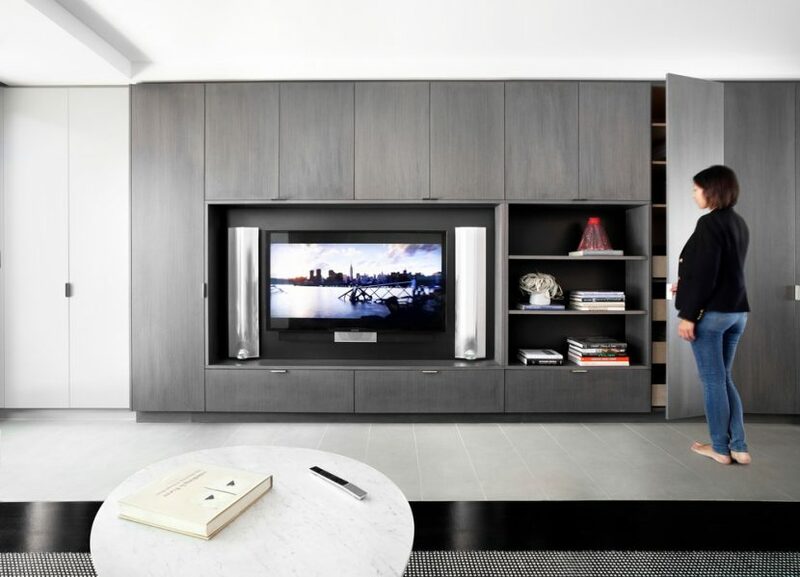 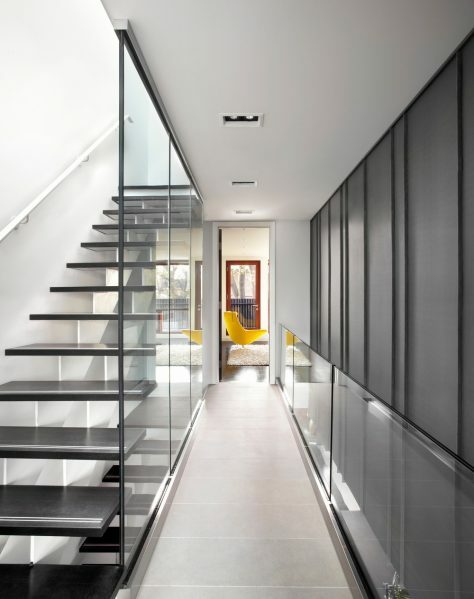 The house was transformed into an open and bright modern home through a series of strategic moves and incisions. 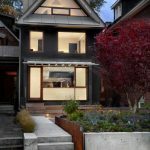 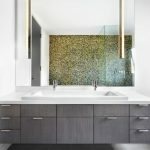 The specifications were to build a modern family home that expands the area of livable space while remaining true to the vernacular of the neighbourhood. 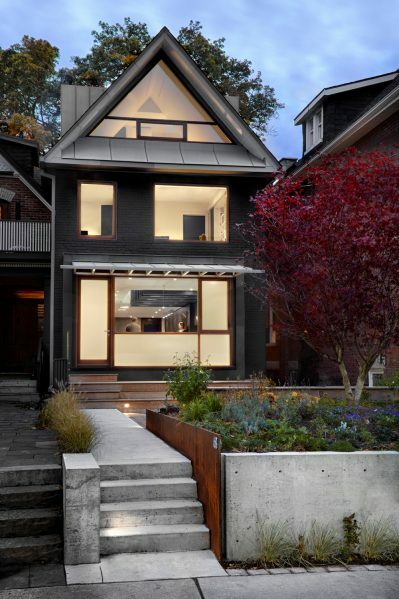 This challenge was met with an emphasis on natural materials and light. 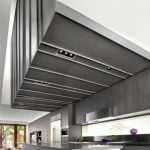 Inspired by rural living and the original build date of the home, industrial materials accentuate re-imagined architectural qualities in an unmistakable contemporary space. 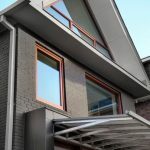 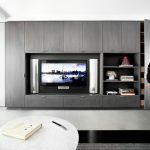 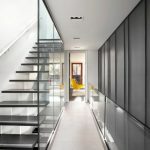 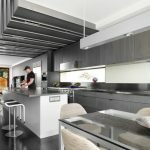 Grey and black zinc used throughout both the exterior and interior of the home is a material that blends traditional aspects with the new contemporary scheme. 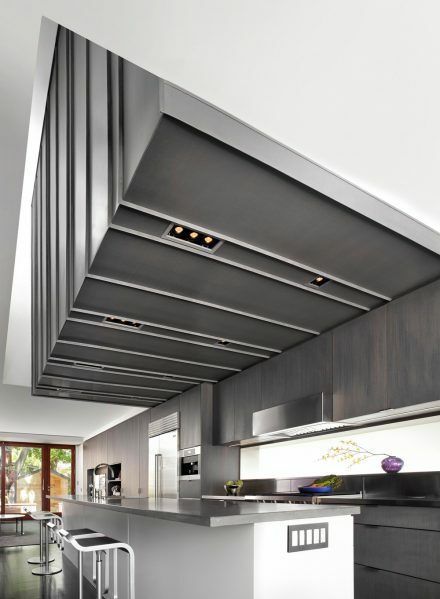 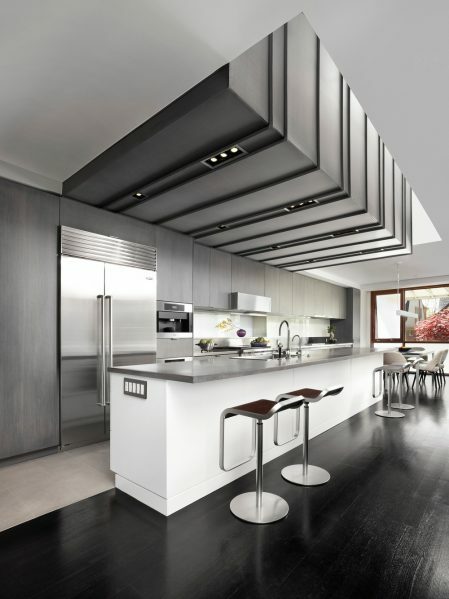 Inside, a vertical shaft brings light from large skylights down three floors illuminating the ground floor while animating a zinc wall and ceiling above the kitchen. 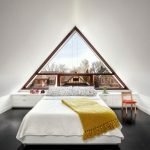 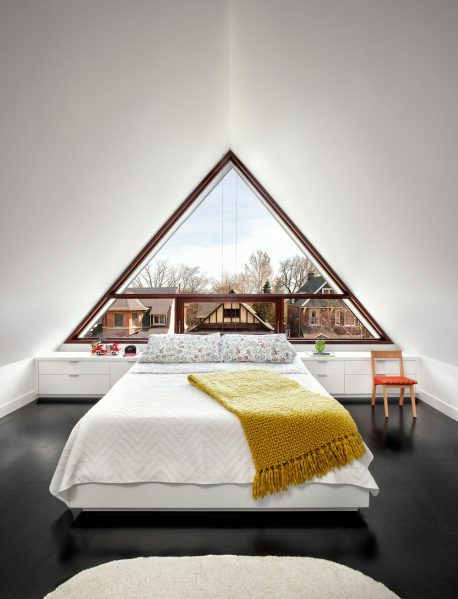 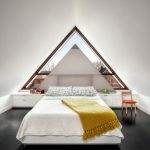 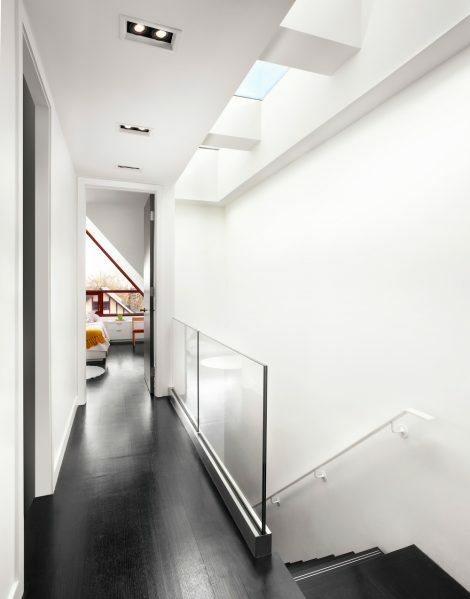 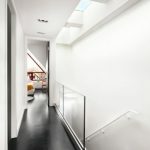 On the third floor, the entire gable has been replaced with an expansive triangular glass window affording views of the neighbourhood and downtown skyline in the distance. 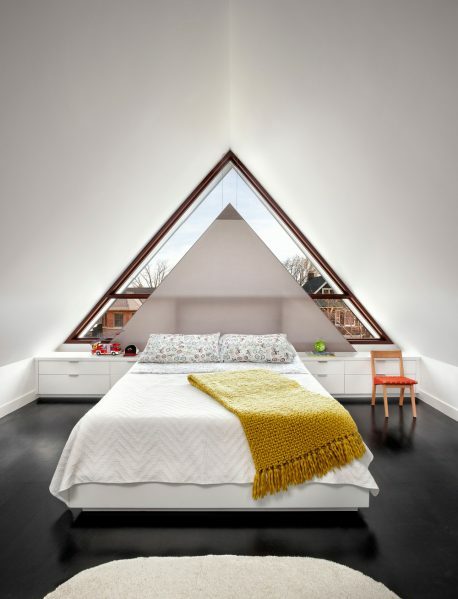 A custom-made triangular blind shades the window and retracts into a millwork unit when not in use. 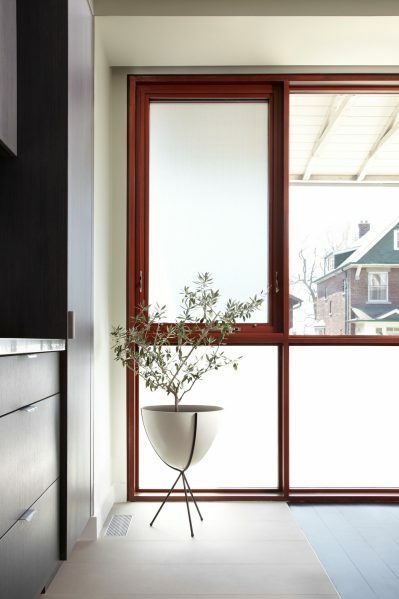 In the kitchen, an original window at the side of the house was reconfigured proportionally to retain its original breadth. 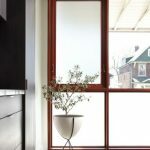 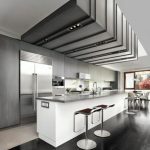 This now horizontal window extends along the kitchen and integrates seamlessly within the millwork of the dining room. 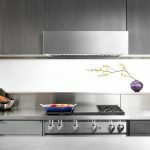 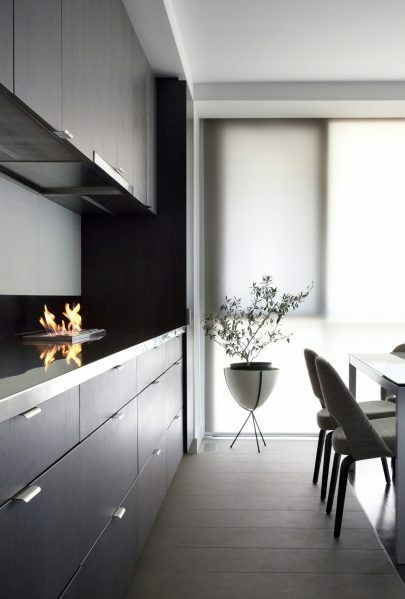 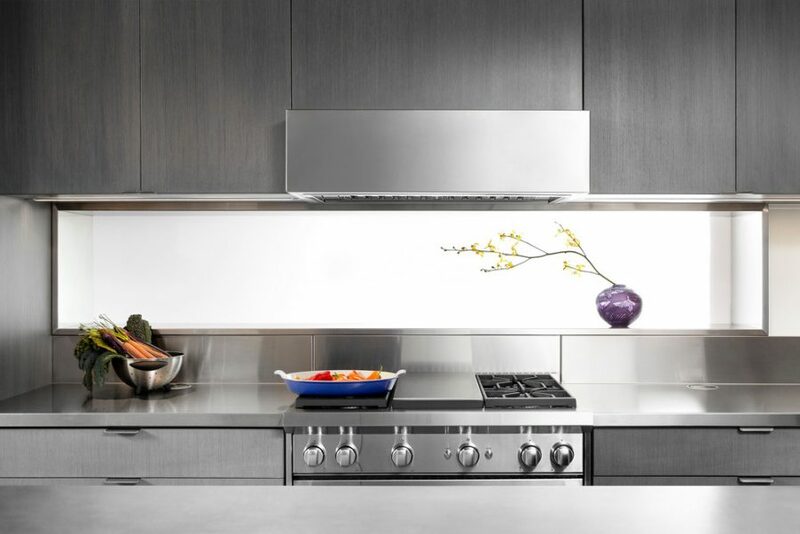 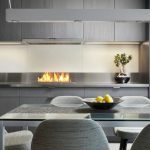 The kitchen counter also extends providing the means for a countertop vent-free ethanol fireplace in the dining room. 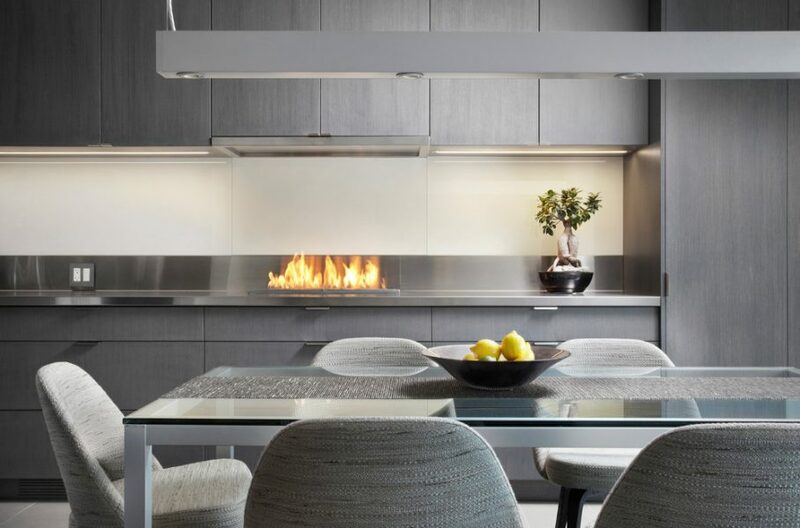 Throughout the home, millwork such as that found in the transitional space between the kitchen and dining room defines overlapping function. 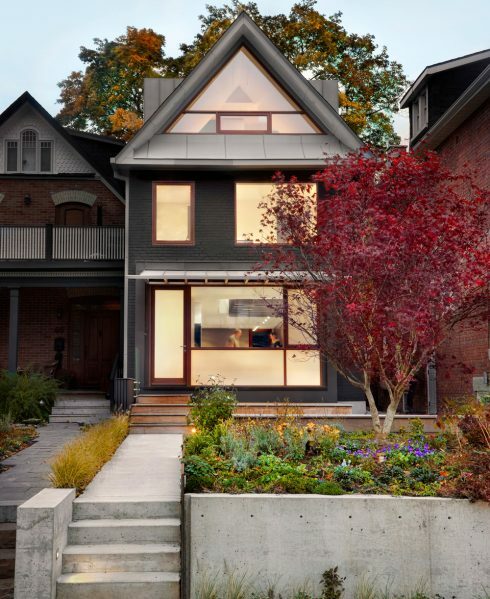 Outside, the rear facade of the home has been entirely transformed to maximize views of the expansive elm tree behind the house; while in front, a large glass pop-out opens up the home to the street while being protected from the sun and elements by a new zinc awning reminiscent of bygone neighbourhood corner stores. 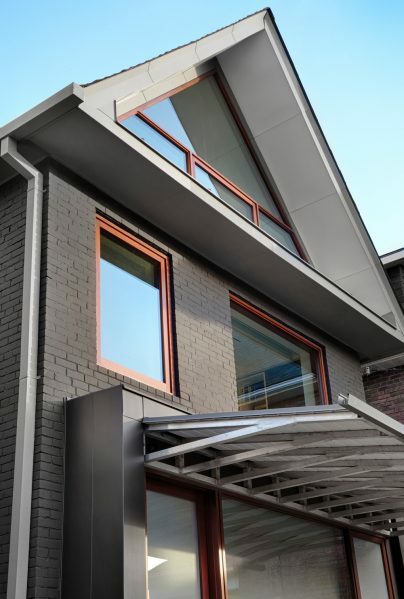 The landscaped berm and retaining walls create a layer of privacy between the public street and the private home which provides a small area of refuge in front of the home for children to play, complete with theatre seating to watch the spectacle of life unfold. 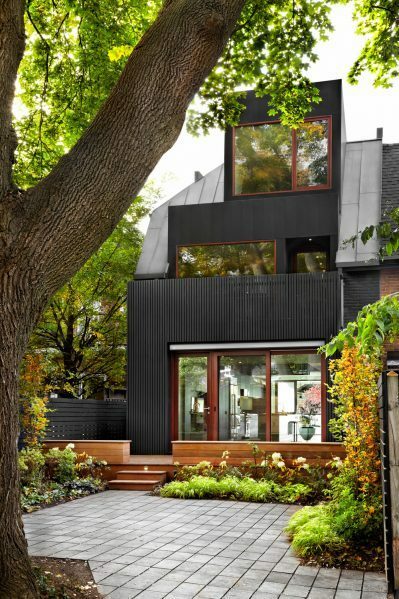 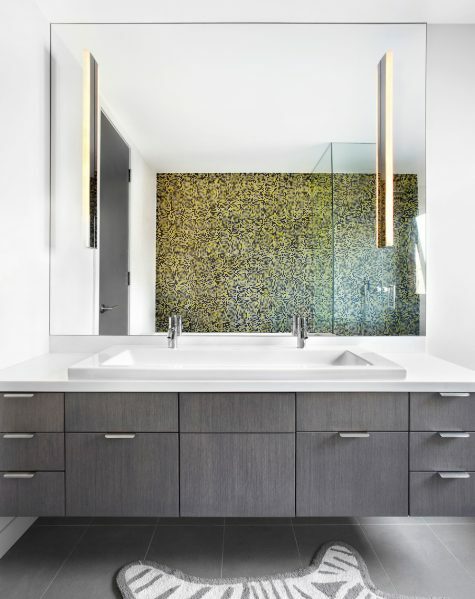 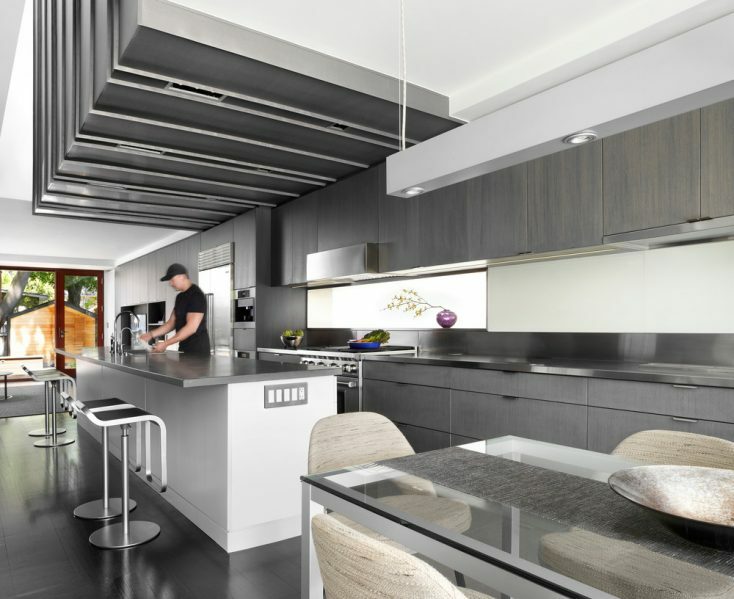 The Zn House was a finalist in the 2015 Best of the Year Awards by Interior Design Magazine.